Brian Burke joined the Calgary Flames Hockey Club on September 5, 2013 in the newly created role, President of Hockey Operations. He is responsible for overseeing all hockey operations for the Flames organization. The 58-year-old Burke, brings over 20 years of National Hockey League experience in various roles to the franchise. In 1,145 games as a general manager in Hartford (84 games: 1992-93), Vancouver (492 games: 1998-99 to 2003-04), Anaheim (263 games: 2005-06 to 2008-09) and Toronto (306 games: 2008-09 to 2012-13), Burke has accumulated a record of 521-449-74-101. Additionally, he worked in the NHL front office for five years as executive vice president and director of hockey operations, under Commissioner Gary Bettman. Prior to assuming his current position in Calgary, Burke was president and general manager of the Toronto Maple Leafs, a title he assumed on November 29, 2008 becoming the 13th general manager in Maple Leafs history. He parted ways with the Leafs on January 9, 2013 and became a pro scout and consultant with the Anaheim Ducks. As executive vice president and general manager of the Anaheim Ducks from 2005 to 2008, Burke guided the Ducks to their first Stanley Cup in 2007, first Pacific Division title (2007), and first two 100+ point seasons (2006-07 and 2007-08). He was ranked No. 1 by The Hockey News in the magazine’s Annual GM Rankings in March of 2008, and was a finalist for The Hockey News Executive of the Year in 2006. Burke was also named the Sporting News Executive of the Year in 2001, and was a runner-up for the same award following the 2005-06 season. Since the 2000-01 season, Burke’s teams have qualified for the Stanley Cup playoffs seven times, playing in 13 total post-season series. In addition, those seven clubs recorded at least 90+ points, including four 100-point seasons. 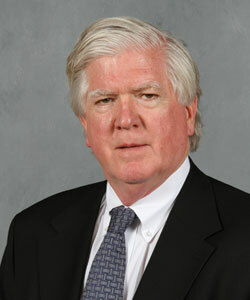 In March 2012, Burke was appointed to the Hockey Hall of Fame’s Selection Committee. He is also an original member of the US Men’s National Team Advisory Group that was formed in 2007 to assist USA Hockey with the selection of players and staff of Men’s National Teams, including the Olympics. He served as the general manager of the 2010 US Olympic Hockey Team, which won a silver medal at the 2010 Winter Olympic Games in Vancouver, and was general manager of the US World Championship teams in 1993, 2009 and 2010. On August 7, 2008, Burke was recognized for his outstanding service to hockey in the United States when he was named the recipient of the 2008 Lester Patrick Award. In honour of his late son Brendan, Burke has been a spokesperson for the ‘You Can Play Project’ since it was co-founded by his son Patrick in 2011. Brendan was a homosexual working as a hockey operations assistant at Miami University at the time of his death. ‘You Can Play’ is dedicated to ensuring equality, respect and safety for all athletes, without regard to sexual orientation. Burke has also marched in numerous Toronto Pride Parades in Brendan’s memory and has candidly spoken out against homophobia and bullying. Alongside several city councillors and representatives of the group Parents, Families and Friends of Lesbians and Gays (PFLAG), he helped raise the Pride flag outside Toronto’s City Hall in May 2011. Burke is also a member of Egale, Canada’s largest lesbian, gay, bisexual and transgender (LGBT) human rights organization. In April 2011, Burke was named Youth Role Model of the Year by Jer’s Vision given to a community leader dedicated to fighting homophobia and bullying. Jer’s Vision is Canada’s youth diversity initiative, which works to address bullying, homophobia, transphobia and discrimination of all kinds in schools and youth communities. Burke also received the Straight Ally Legacy Award from the Federation of Gay Games (FGG) in October 2011, PFLAG Toronto’s Ally Award in January 2012, and was honoured by Courage Campaign Institute with a Spirit of Courage Award in September 2012 for his continuing work and dedication in the LGBT community. In 2010, USA Hockey created the ‘Brendan Burke Internship,’ which is an annual internship for a recent college graduate interested in pursuing hockey operations as a career. Burke is a devoted supporter of Police Services and was given honourary Police Chief status in Toronto in April 2012. In November 2011, he purchased and donated a horse named Moose to Toronto’s Mounted Police Unit in memory of his late son Brendan, who shared the same nickname. In May 2011, Burke and the Honourable John P. Manley, President and CEO, of the Canadian Council of Chief Executives, were presented with the Easter Seals Toronto’s Tribute Award for lending support to kids with physical disabilities and for excellence in business and community service. Burke is also heavily involved with the military, visiting bases within Canada, the United States and Afghanistan. He has been associated with the Wounded Warrior Project since 2003, which honours and empowers wounded warriors. The programs raises awareness and enlists the public’s aid for the needs of injured service members, helps injured servicemen and women aid and assist each other, and provides unique, direct programs and services to meet their needs. At the 2010 Olympics, Burke and a volunteer group called Operation Homefront paired each of the 23 hockey players on Team USA with service members wounded in Iraq or Afghanistan. He felt the players would have extra pride and motivation to not only be representing their country, but an American war hero wounded in battle. Burke is an avid supporter of many philanthropic organizations, devoting time and making numerous donations to each. Some of these organizations include: Ducks Unlimited Canada (DUC), a registered charity that partners with government, industry, non-profit organizations and landowners to conserve wetlands that are critical to waterfowl, wildlife and the environment; the Canadian Safe School Network (CSSN), a national, not-for-profit, registered charitable organization with a mandate to reduce youth violence and make our schools and communities safer; Big Brothers Big Sisters of Canada, who commit to Canada’s young people to be leaders in providing them with the highest quality, volunteer-based mentoring programs; Special Olympics which provides year-round sports training and athletic competition in a variety of Olympic-type sports for children and adults with intellectual disabilities; and Kids, Cops & Computers Merry-Go-Round Children’s Foundation which enables financially disadvantaged students to achieve excellence in their academic and personal pursuits by providing them with brand-new computers and police mentorship. Burke took part in the 2012 Sleep Out for Homeless Kids, helping raise awareness and funds for Covenant House. He also attended the official launch of the 2012 Shoppers Drug Mart Tree of Life Campaign in support of Toronto East General Hospital, was an honoured guest at the 2012 CAMH Healthy Minds dinner to raise awareness for mental health, and supported the Rick Hansen 25th Anniversary Relay in 2011 to raise awareness and commemorate Hansen’s Man in Motion World Tour commencing its historic cross-Canada journey. Born in Providence, Rhode Island but raised in Edina, Minnesota, Burke is a graduate of Providence College. While attending Providence, he played for the Friars Division-I hockey team. As a professional he played in the AHL, capturing the Calder Cup with the Maine Mariners in 1978. After one year in the AHL, Burke attended Harvard Law School, graduating in 1981.